FamilyGoKarts.com: Load It Up: Trailers Ready To Answer Your Every Call. Load It Up: Trailers Ready To Answer Your Every Call. For years the American automobile was too small to carry everything we drivers needed. In response to the growing demand for larger cars and more packing space, auto manufacturers introduced vans in the 1960's. In 1984, Chrysler changed the way Americans traveled forever when they rolled out the first minivan. The success of the people-haulers like the van and the minivan gave way to the SUV craze that started with the Jeep Cherokee and the Ford Explorer. All of these were created for one reason: to provide the American traveler with more room. Room to pack, load, push, squeeze, cram and squish everything, I mean everything, into the car to hit the road and be prepared for any potential (if completely unrealistic) situation that might arise. However, with the average size of new cars in the U.S. on the decline and stricter MPG guidelines being handed down by the government, Americans are once again searching for unique and practical solutions for hauling their "stuff" hither and yon. FamilyGoKarts is proud to offer a wide selection of trailers created to deliver the perfect solution for virtually any need. One of the first things to determine is whether you want to pull ATVs, carts or other equipment without protection from the elements. Many customers are looking for simple solutions that allow them to pull their toys to a destination for adventure and keeping them clean before they get dirty is the last thing on their mind. For this job, we offer utility trailers with ramps starting under $800 and ranging to about $1600. Price differences are usually based on the number of ATVs or carts that can be pulled and whether the trailer features side gates. 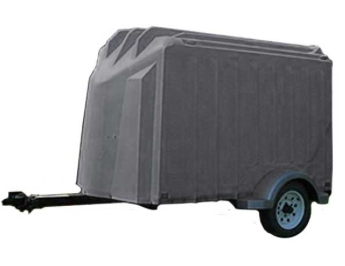 If you're seeking to load more equipment into a protective shell for hauling, then look no further than our modern and durable collection of enclosed utility trailers. These useful options begin at just under $2,100 and feature expansive space and storage options without the worry of damage from rain, snow or sun. Many, like our Yuppie Wagon, offer customizable color options and your choice of a fold down or swinging door. The Pulmor Enclosed Cargo Utility Trailer offers a compact and efficient manner in which to carry up to 1,000 pounds of equipment for your vacation, business or leisure trip. Finally, our EZ Tow Enclosed Trailer provides you a choice on the length of the trailer and can be pulled by cars as small as a Ford Focus or PT Cruiser! Cars my be shrinking again, but that doesn't mean you have to sacrifice space. Whether your family is growing, your hobby requires more equipment, or you just need more room to pack for the family Christmas get-together, FamilyGoKart is here to help you haul more.